It is a strange feeling to hear a musician and instantly feel connected to them. This is the case with the tone of B.J. Jansen. His bari tone sounds exactly like the tone I hear in my head when I play. I am not suggesting that I sound like him. I do not sound like the tone I hear in my own head. When I listen to recording of myself I never sound the same as in my head. He on the other hand is my imagination made real. His tone is husky, dark, and above all else clear. It has the classic sound of a big chamber mouthpiece and lots of air to support the big hulking horn. This album surprised me more than anything else I’ve heard recently, short of the “Call me maybe” musical meme trouncing all others on the net. 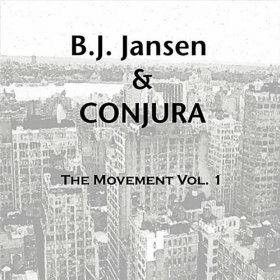 I had never heard of B. J. Jansen or the group he leads called Conjura before I pressed play. What greeted me was collection of musicians which from their makeup made me think cool jazz. The lineup is Bari, Trumpet, Drums, Bass, and Piano. With a lineup like that I almost expected to here Gerry Mulligan and Chet Baker to come out of my speakers. That was certainly not the case but it does show that the combination still has viability and as much auditory appeal as it did 60 years ago. The complimentary ranges and tones allow for a depth that I don’t think is possible with instruments whose ranges overlap completely. I have to draw attention to the other wind voice, Daud El-Bakara. What impressed me the most, is his use of space in his solos. Sure, his runs are a tad sloppy at times but I think it adds to the overall feel of the music. His style compliments Jansen while never stealing the show with absurd altissimo or too clichéd licks. I don’t mean to suggest his playing is only adequate. It is quite the opposite in my opinion. He has something to say and with every opportunity he does and that helps keep the music vibrant and moving. I am always cautious when doling out criticism because the first response is usually “Can you do any better?” and in some cases it is a yes and in others it’s a no but I listen to more baritone music than most. I spend 4 to 6 hours listening to an album before writing about it. With that out of the way I not particularly enamored with Jansen’s improvisational style for a artist whose name is listed aside from the group he leads. In some pieces his improvised solos tend ramble compared to other solo artists I’ve reviewed. It’s only on a couple songs where this seems to be the case. “Relaxin’ with Jessica” is one of them but in contrast is the first 1:40 of his solo on “Brandon’s Blues. Very laid back and open sounding as he is accompanied by only the bass. Take Away: Buy it. This album is well made and a good listen. There is a lot to like but sadly I did not personally connect to the album as a whole. I would recommend listening to it as there are great phrases to learn and it’s priced very well on Amazon.com. Features you want to see?